Jim is the founder and President of Croft & Associates Architecture, a full service architecture firm located in Acworth, Ga. The 18-person firm was founded in 2005. He holds a Bachelor of Architecture and a Master of Architecture from Georgia Institute of Technology. He is an active member of Acworth United Methodist Church and has served on the Board of Trustees as Chairman for past 8 years. 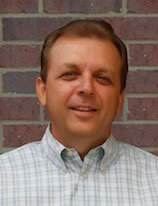 Jim has lived in the Acworth area for nearly 25 years. He has been married to his wife, Leslie for 27 years and they have 3 children: Brett (23), Marissa (21) and Emily (17).